Based out of Brooklyn, where she practices full-time as a conceptual documentary artist, she is a current fellow at the Center for Emerging Visual Artists, an arts program based in Philadelphia, Pennsylvania. Cornwall sat down with Artrepreneur to reflect on her evolving career and activism through photography. KV: Tell me about yourself: When did you begin exploring photography and why? Debi Cornwall: My dad, who was an amateur enthusiast when I was a kid on the South Shore of Boston, introduced me to photography. My high school had a photography program and I loved how carrying a camera made me see the world differently and look more deeply. As I learned more, I was drawn to classical social documentary and its empathic approach to injustice and suffering. KV: You were a civil rights attorney before becoming a full-time photographer. Can you tell me about your educational and career trajectory? Debi Cornwall: I studied Modern Culture and Media at Brown University—basically critical theory—with a production focus on photography, which I fulfilled with classes at RISD. During my senior year, I worked as an AP stringer. But I didn’t get the job at the local newspaper when I graduated, so I joined the migration to Brooklyn and ended up finding work as an investigator and trial assistant at the federal public defender’s office. I was hooked, and two years later left for Harvard Law School. I clerked for a federal judge and then practiced for more than 12 years as an attorney at a public-interest law firm representing innocent DNA exonerees in civil-rights lawsuits. KV: How has your routine changed from attorney to photographer, and in what ways has it not? Debi Cornwall: You can take the lawyer out of lawyering, but the training and habits definitely persist. If I’m not on a shoot, my workday starts with coffee at the computer. That’s where most of my practice happens. I’m researching a topic, looking for ideas or connections, negotiating access, drafting grant proposals, or editing photographs. It turns out that digging up evidence, exhaustively researching, and conducting sensitive negotiation are equally central to my artistic practice as they were to my advocacy. I’m marshaling evidence to understand a problem and convey it visually. The major difference is that, whereas lawyers are looking to solve problems, as an artist I’m more looking to understand an issue and pose questions rather than answering them. KV: Tell me about your studio practice, what attracts you to a particular subject? Debi Cornwall: My work is driven by curiosity about the operation of American power in the post-9/11 era. What does it mean to be an American now? Who decides? What do we not see about ourselves? What stories do we tell? KV: How did the Guantanamo project get started? 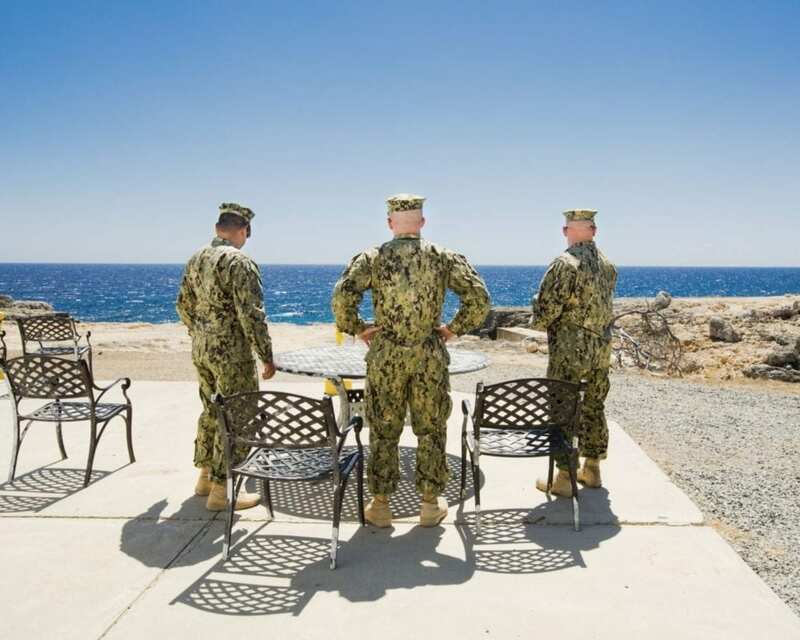 Debi Cornwall: My original idea was to photograph men cleared and released from Guantánamo Bay, whose struggles felt similar to my former exoneree clients’ struggles to rebuild their lives, but much more complicated. Yet my initial attempts went nowhere. Why should anyone have opened their lives to me at that point? I was little more than a lawyer who took pictures. Though I wasn’t particularly interested in visiting the U.S. Naval Station in Guantánamo Bay, since I assumed there was little more to see than the orange jumpsuits and barbed wire we’d seen a million times, I decided to try to go anyway, if only to move forward with the idea. KV: Logistically speaking, what was the process of getting funding, finding permissions and gaining access? Debi Cornwall: It took quite a bit of digging even to discover whom to ask for permission. I wrote a vague proposal seeking to document the daily lives of both “detainees” and guards, and sent it along with a bio and waited. Nine months later, I had passed a background check and was approved to visit. Permission comes with twelve pages of rules: no photographs of infrastructure, no locking mechanisms, no surveillance equipment. Certain sections of coastline were out, and no faces could be photographed. Even partial profiles would be deleted in daily “Operational Security Review.” From 2014 to 2015, I made three visits, which resulted in the first two chapters of the project: Gitmo at Home, Gitmo at Play—which documented the residential and leisure spaces of prisoners and guards—and Gitmo on Sale, documenting gift-shop souvenirs sold on the military base. Originally my goal was simply to invite renewed attention to Guantánamo Bay. After more than a decade of holding men without charge or trial, most of us had stopped looking. Once I published an early version of the work in the New York Times Lens Blog, though I realized I could think bigger. I self-funded my three trips to Guantánamo Bay, mainly because I wasn’t convinced I’d find a new way to render it visually. It seemed premature to ask someone else to invest in me. Later, as I began the third chapter—environmental portraits of 14 men cleared and released from Guantánamo, in nine countries around the world—I applied for fiscal sponsorship with the New York Foundation for the Arts (NYFA), which made me eligible for grants from funders who only give to nonprofits. Ultimately I was able to fund the entire production and most of my book, Welcome to Camp America: Inside Guantánamo Bay (Radius, 2017), with grants. KV: How did you become involved with the CFEVA fellowship program? Debi Cornwall: The CFEVA Fellowship has been a remarkable gift. I’m actually based in Brooklyn, New York, so I skipped past it the first time I came across it in my online funding searches. But in reading the fine print, I realized that I live within the eligible geographic range, so I applied. I’m grateful to be a part of it! KV: What do you think are some of the primary issues that Philadelphia-based artists face? Debi Cornwall: There’s a sense in Philly that most of the action is up in New York, that it would be easier to get attention, find a gallery, and make a name elsewhere. But the flip side to that is that NYC is awash in artists. It’s so huge that it can be hard to find one’s people, much less a professional niche. I’ve been thrilled that the CFEVA Fellowship has offered me a glimpse of the Philly scene, which seems so supportive and tightly knit – a real community. After the opening of my current show at the Philadelphia Photo Arts Center (on view through August 25), I had a chance to meet with members of the Women’s Mobile Museum, an unprecedented long-term training program for local second-career emerging artists and arts professionals under the guidance of gifted South African photographer Zaneli Muhole and PPAC Deputy Director Lori Waselchuk. There’s a wealth of incredibly talented artists in Philly, and next-level support and programming you don’t see anywhere else. KV: What are you working on as part of the fellowship program? Debi Cornwall: I’m now in the second year of the two-year fellowship, and I’m developing a new project, “Necessary Fictions.” Inspired by my time with my military escorts at Guantánamo, I’ve become interested in the human experience of preparing for war. On a more meta level, I found Guantánamo to be a place where reality was staged for public consumption: the “compliant detainee media room,” the “comfort items” laid out in a show cell on the media tour. When I later met men who had occupied those cells, I learned that many of the items on display had rarely, if ever, been made available to the prisoners. Thus, I’m now looking at the performance of American power, from military training exercises to Hollywood productions. I’m branching out from still photography into using more testimony and archival material, sound, and found video footage. It’s a little daunting, but the team at CFEVA has been very encouraging as the project evolves. KV: Why should young artists actively seek out those types of opportunities? Debi Cornwall: Seeking out funding and support can be a full-time job in itself. It may not be the most fun part of the practice, but it’s critical, and can be incredibly rewarding. Obviously the financial support is huge, especially since I seem to have chosen an expensive way to work, involving lots of travel. But equally, if not more importantly, the fellowship comes with guidance, community, mentorship and advice. It’s a reality check as new work evolves, another set of eyes on grant proposals, and great ideas about how to get it seen. As I complete my transition from advocate to artist, and from photography to a more varied conceptual art practice, the CFEVA fellowship has been an incredible support, helping me to re-imagine what might be possible. My best advice to artists starting out, whether they consider themselves young or not (ahem), is: if in doubt, apply. Suspend your disbelief and make a case for yourself. You may be pleasantly surprised.